In 2005, Suraj Kamath began working for Bosch Engineering in India as an automotive engineer. 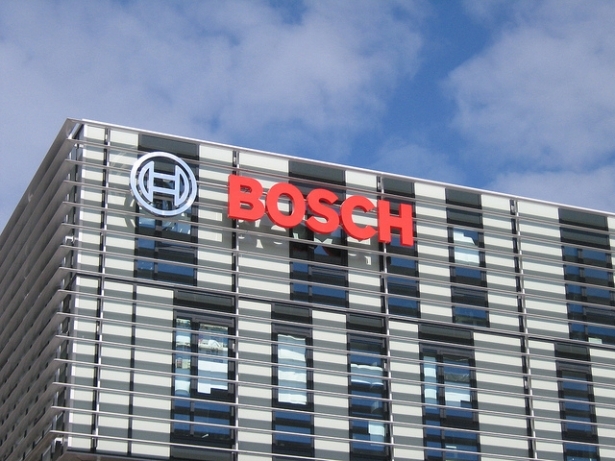 In March of 2009, Bosch moved him to its test facility in Santa Barbara, CA. under an L-1 visa, which allows American companies to transfer employees based in foreign countries to the United States as “guest workers.” And in December 2012, Kamath says he received a letter from Bosch informing him that he needed to pay the company $45,102 in federal and state tax refunds that he had received over the previous three years. When Kamath refused to hand over his refunds, to which he was legally entitled, he was met with another unwelcome surprise. According to a complaint he filed in federal court on Wednesday, Bosch threatened to send him back to India if he didn’t pay the thousands of dollars that it claimed he owed. First, American workers should have a first crack at available jobs. To that end, business and labor are committed to improving the way that information about job openings in lesser-skilled occupations reaches the maximum number of workers, particularly those in disadvantaged communities.Second, there are instances—even during tough economic times—when employers are not able to fill job openings with American workers. Those instances will surely increase as the economy improves, and when they occur, it is important that our laws permit businesses to hire foreign workers without having to go through a cumbersome and inefficient process. Our challenge is to create a mechanism that responds to the needs of business in a market-driven way, while also fully protecting the wages and working conditions of U.S. and immigrant workers. 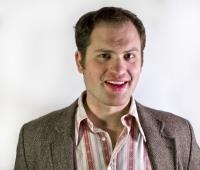 Among other things, this requires a new kind of worker visa program that does not keep all workers in a permanent temporary status, provides labor mobility in a way that still gives American workers a first shot at available jobs, and that automatically adjusts as the American economy expands and contracts. On June 14, five Democrats on the Senate Appropriations Committee joined 14 Republicans to help pass an amendment sponsored by Sen. Richard Shelby (R-Ala.) that would block funding for the enforcement of a new H-2B guest workers protection rule issued by the Obama administration. Approximately 115,000 guest workersare working in the United States on H-2B guest worker visas. The program allows companies to bring in workers into the United States to work when they claim that they cannot find American workers to do the job. However, workers’ rights advocates claim the program is often abused by companies to hire workers in industries like construction. Currently, 14.2% of construction workers are unemployed. A recent Department of Labor internal audit found that nearly half of all companies using H-2B guest workers are not in compliance with federal laws about their usage. Labor advocates claim that the H-2B visas programs are often used to pay workers lower wages. One study by the Economic Policy Institute found that workers on H-2B visa in the seafood industry make on average $10,000 a year less than American workers in the seafood industry. Editorial Note: We are reposting this article with permission of the author from the Working in These Times blog. 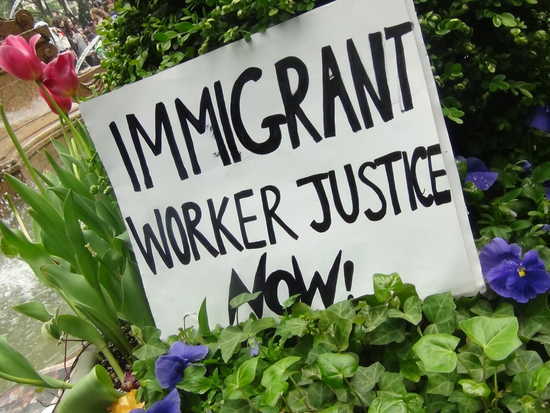 Talking Union has been covering stories about the struggles of immigrant workers over several years. 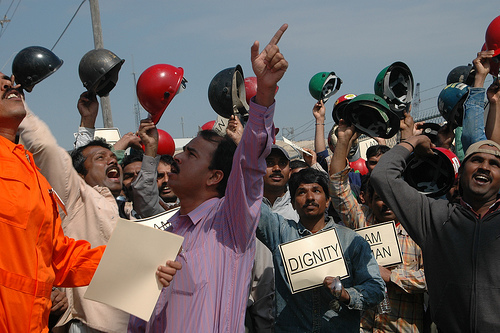 In 2008 we extensively documented the uprising of pipe-fitting “guest workers” from India at the shipyards of Signal Industries in Mississippi and Texas. We applaud the initiative and courage of the students from many countries in fighting back against their exploitation by a whole daisy chain of sub’contracted employers and bureaucratic minions that culminates in the global confectionery giant Hershey. Hershey has been steadily whittling away at its union organized workforce in and around Hershey, while exploring every channel to locate cheap and exploitable workers. Despite their linguistic and cultural differences the student workers, with help from the Guestworkers Project and Pennsylvania unions, overcame every barrier to their self-organization. They deserve all our support, in particular when the employers, backed by government authorities as they always are, retaliate against uppity guest workers by threats and actual expulsion from the USA. sit-in at the warehouse’s entrance.